I’ve been an Indy resident for almost two years now, but there are some times I still feel like the new girl. Like now for instance…how have I never learned about the Mutt Strut before?! 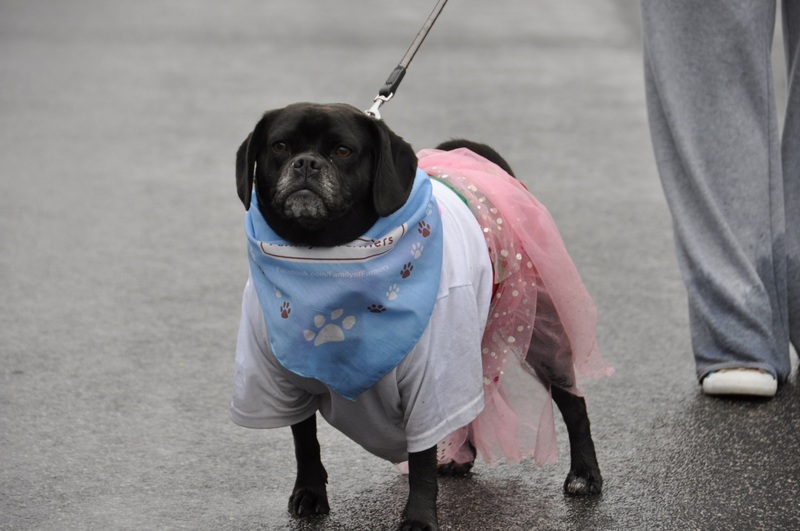 Mutt Strut is this fun event where people get to bring their pooches, dress them up in festive doggie gear, and enjoy a 2.5 mile stroll around the famous Brickyard track at the Indianapolis Motor Speedway… and it all goes for a good cause! Known as the “Greatest Spectacle in Dog Walking,” Mutt Strut is the largest single fundraiser for Indy Humane, the leading voice for animal welfare in Indianapolis. Since 1905 the Humane Society of Indianapolis (now Indy Humane) has provided shelter and care to animals in need on their way to loving homes. 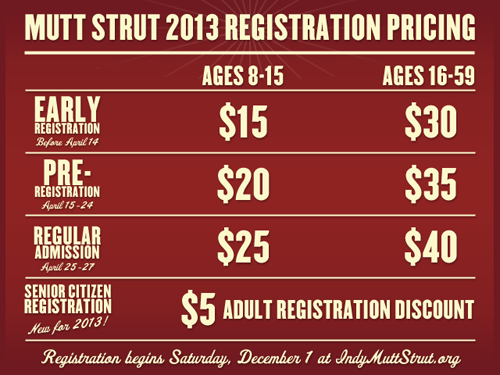 Indy Humane is an independent nonprofit supported solely by donations, grants, and fundraisers like Mutt Strut. And just a note, Indy Humane does not receive any funding from, nor is it managed by, the Humane Society of the United States. As I kept researching this event, I kept realizing just how out of the loop I was. This is the 10th year for Indy’s annual Mutt Strut and it brings more than 6,000 people and their canine companions to IMS to stroll around the track! That’s a lot of pups! In addition to the brickyard stroll, there will be a full day of activities for you and your pooch to enjoy! 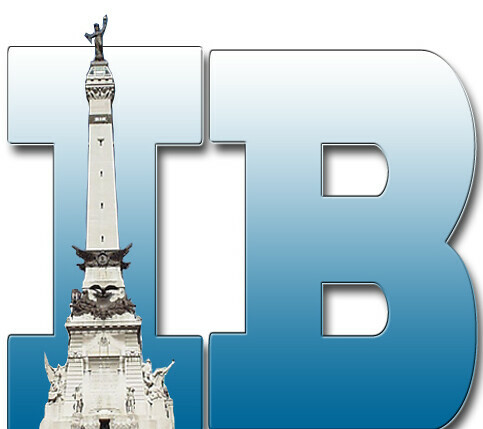 You won’t want to miss the “Party on the Plaza” where you can find sponsor booths, dog treats, low cost microchipping, and appearances by: Indy Indians’ “Rowdie”, Colts’ “Blue”, Butler’s “Blue II and Blue III” and IUPUI’s Jaws. When you get there, be sure to stop by the Indiana Family of Farmers booth and pick up what all the best dresses pups are wearing these days – an IFOF Doggie Bandana! 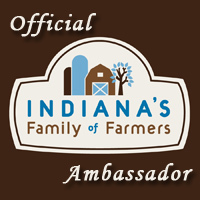 Indiana farmers love their animals and are excited for this opportunity to support a local shelter. This little pup looks so cute in it’s IFOF Doggie Bandana! Doesn’t this whole day just sound like a blast! What are you waiting for? Get on over to the Mutt Strut website and sign up to participate! I know all this chatting about canines has me wishing I had a dog right now so I could join in the fun! Here’s how to register: Click HERE to register online, or print off the paper registration form. Can’t make it on April 27? Don’t fret! You can join the Drowsy Dog and Cat Nap Club! For $45, they still mail you a t-shirt, you can sleep in on Saturday morning, and you’re still helping the event! For those of you who will be attending, Gates Open at 9:30 a.m. and Opening Ceremonies begin at 10:45 a.m. with the Strut starting at 11 a.m. If you have any other questions or just want to learn more, you can check out all of the doggie details at www.indymuttstrut.org! I’ll be looking forward to seeing all of you and your pretty pooches at the Indianapolis Motor Speedway this weekend! Posted on April 22, 2013, in Indy Adventures and tagged 10th Annual Mutt Strut, doggie bandana, dogs, dogs of Indy, humane society of indianapolis, Indiana Family of Farmers, Indianapolis Motor Speedway, Indy Humane, Indy Humane Mutt Strut, Mutt Strut, Mutt Strut - April 27, Mutt Strut 2012. Bookmark the permalink. 1 Comment. Awesome, can’t wait to see you there!